"International Day of People with Disability is a United Nations sanctioned day held on 3 December each year celebrating and recognising the achievements, contributions and abilities of people with disability," Mr McCormack said. "The Royal Australian Mint has a long and proud history of reaching out to many Australians with important messages through their commemorative coinage and today's coin release is yet another fantastic example of its work. 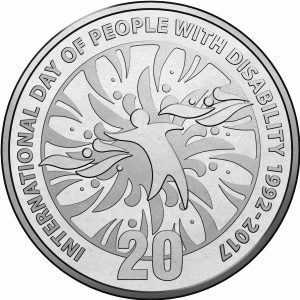 "The coin features an artistic extension of the International Day of People with Disability logo which is used globally to encourage recognition and inclusivity." "More than 4.3 million Australians live with some form of disability. As a nation, we all have a role to play in empowering people with disability to live the life they choose," Mrs Prentice said. "I encourage everyone to start a conversation about disability at their workplace, school or community and make Australia a more inclusive place for everyone." "As a successful Paralympian and business owner, I am proud to say that my disability has not stopped me from living my dream. My turning point was putting myself out there and challenging my insecurities and expectations of what I could achieve," Mr Alcott said. "One in five Australians lives with a disability, but it is still not an easy topic to talk about. Join with me this International Day of People with Disability as we start a national conversation to change perceptions so everyone with disability can live their dream."